Home Opinion Featured Articles Why must police return Chinese cash? Why must police return Chinese cash? HYPOCRITICAL SOCIAL MEDIA CAMPAIGN CALLING ON THE POLICE TO RETURN GHS 50,000 CHINESE SOCIETIES DONATION MUST STOP. It will be recalled that the Association of Chinese Societies in Ghana recently donated a sum of GHs 50,000 to the Ghana Police Service following a request made to them sometime ago by a former Director of Pips Joana Osei-Poku to support the construction of office complex for the Police Intelligence and Professional Standards (PIPS) at the Nima Police Station. The donation as we are all aware is to support the Ghana Police Service combat crime and improve police professional standards in the country. But unfortunately, some people in their usual elements have gone to town asking the police to return the money. That is how cheap the popularity seeking venture has become in this country. People will do and say just anything to become popular even if that will tarnish the reputation of others. These people who are engaged in that disingenuous social media campaign demanding that the Ghana Police Service returns the said donation to say the least, are engaged in mischievously unpatriotic activity aimed at discrediting and hurting the relationship between Ghana Police Service and the good people of China who have over the years supported the service in diverse ways. This akin to just another subtle way of giving currency to the widely held belief of giving the dog a bad name just so that it can be hanged. What correlation exists between fighting gallamsay menace and a request support that was made longtime ago for the construction of an office complex for Pips is something that kept agitating my mind since I got to know of the social media campaign. I just don’t get it all! Are we saying that going forward our government should not accept any grant, support or loans from the Chinese government again simply because we are fighting gallamsay? How a request that culminated in a donation to support a worthy project has suddenly become part of a grand plan by the Chinese to “bribe the service” so that it will be soft on the fight against illegal mining is something I am still struggling to come to terms with with the kind of thinking some of these social media freak individuals are engaged in. Such shallow thinking is just mind boggling and the earlier we stop it the better for all of us. Again, are we saying that there are no genuine Chinese businesses and business men in this country capable of contributing or supporting the the Ghana Police to overcome the myriad challenges it faces? When did all Chinese companies and its citizens in Ghana become illegal miners that all of the sudden, we don’t need their support again? Are we saying that all the loans and grants the Chinese Government has been extending to us are aimed at influencing our fight against gallamsay? Are we saying that the police should have refused to take the Chinese Societies support or return it simply because some Chinese people are engaged in gallamsay? Have those saying that considered the diplomatic difficulties we stand to face if say we were to return the money back to the Chinese societies in Ghana only to go and accept another from a different country tomorrow? To the extent that the Ghana police service aims to be a world class police service committed to the delivery of planned democratic, protective and peaceful service, it is expected to perform its constitutional role of protecting everyone without partiality and discrimination. So, it was in proper order that the Ghana police service did not discriminate against the Chinese simply because some of its nationals are engaged in gallamsay. By opening its doors and accepting a donation from the Chinese society in Ghana, the Ghana Police Service has demonstrated that it does not discriminate against any group of foreign citizens in the country. I believe the Chinese meant well and the Ghana Police Service as well, because if they both had any clandestine motifs, they wouldn’t have invited the media to cover the donation ceremony at the police headquarters and this should be a conveniently convincing reason for those engaged in the social media campaign to rescind their decision and redirect their energies to supporting government and the police service to fight the gallamsay menace to save our environment. We all agree that the police service has a lot of logistical constraints that needs urgent support. We all do agree also that the needs such support from right minded individuals and organisations to compliment government efforts at making the Ghana Police the reputable international standard police service that it ought to be. It is in this regard that I want to urge all those exhibiting the “Konongo Kaya attitude” on social media who will not contribute to the course of the police but are ever ready to ask the police to return the monies right thinking people contribute to it to desist from that and support the police. 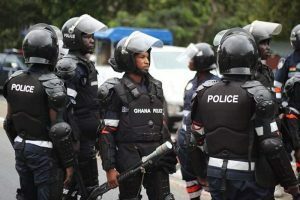 People who are hell bent on becoming popular by running the police down on social media need to take a second look at their behaviour and see if they succeed in making the police unpopular in the eyes of all Ghanaians whether they can survive without the police. Help the police to help you. Avoid running the police down all the time because it is not in your interest. “My mouth has fallen” somebody should continue from where I left.